Dutton Books for Young Readers, 9781101994580, 256pp. E.K. Johnston is the #1 New York Times bestselling author of several YA novels, including the L.A. Times Book Prize finalist The Story of Owen and Star Wars: Ahsoka. Her novel A Thousand Nights was shortlisted for The Governor General's Award. The New York Times called The Story of Owen “a clever first step in the career of a novelist who, like her troubadour heroine, has many more songs to sing" and in its review of Exit, Pursued by a Bear, The Globe & Mail called Johnston "the Meryl Streep of YA," with "limitless range." E.K. Johnston lives in Stratford, Ontario. Follow her on Twitter at @ek_johnston. “Gripping and devastating.” —Anne Ursu, author of The Real Boy. 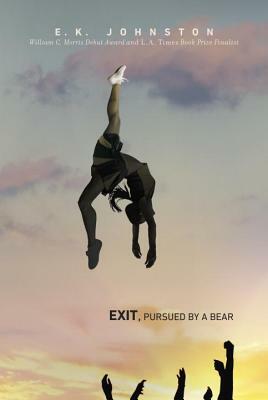 "Exit, Pursued by a Bear is a must-read. Bracing, intimate, tense, and delightful. "—Martha Brockenbrough, author of The Game of Love and Death.